Opposition gain more control in Libya Jump to media player Forces opposed to Colonel Gaddafi appear to be taking control of more of Libya. 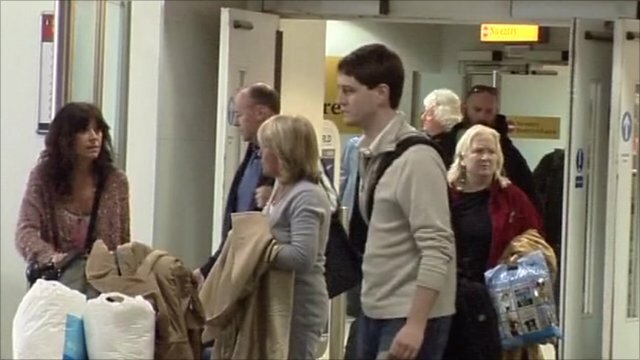 Britons return home from Libya Jump to media player British nationals have been arriving back home from Libya while rescue efforts have been stepped up with chaotic scenes at Tripoli airport. 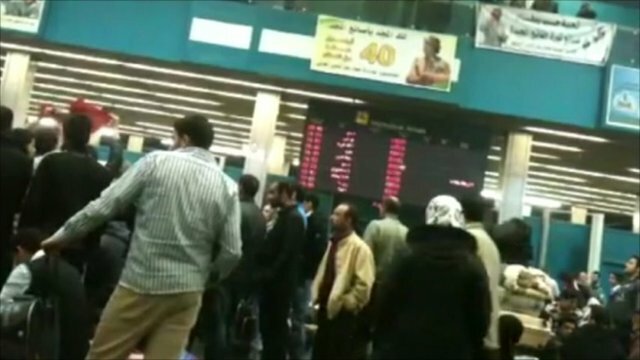 'Mass hysteria' at Tripoli airport Jump to media player A British oil worker has described scenes of "mass hysteria" at Tripoli airport, where thousands of people have been trying to catch flights out of Libya. Forces opposed to Colonel Gaddafi appear to be taking control of more and more of Libya. The western town of Zuwara is the latest to reportedly have fallen to the protesters. Fighting is also continuing in the third-largest city of Misratah as well as the town of Zawiya. Witnesses say the capital, Tripoli, is heavily guarded by forces loyal to Colonel Gaddafi, with tanks deployed in the suburbs. Alistair Leithead reports from neighbouring Egypt.